The Sacrament of Baptism is very special milestone for a child. You can commemorate the special day by gifting a personalized pewter dog tag. 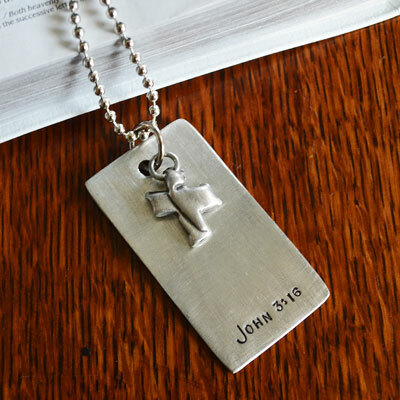 This tag has been pre-stamped with "John 3:16". The pewter dog tag measures 1” x 2” (classic dog tag size) and normally comes on a 24” steel ball chain along with a Cross Charm (3/4"), arranged together on red satin ribbon. For an additional $13 add the person's name (up to 10 characters). 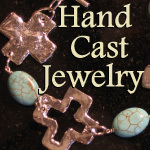 Allow up to 1 week for hand stamping. For additional stamping on the back of the tag... fill in the text that you want and then select the appropriate box to indicate how many characters that you will be stamping on the back. Max characters allowed is 75.